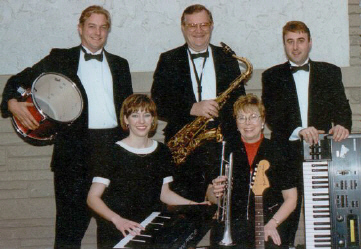 The Downtowners is a 5-piece variety band with over 30 years of experience, specializing in a wide range of musical styles including: Big Band & Swing, 50’s – 60’s Rock, Jazz & Blues, Polka and Old time music, Country, Latin, Ballroom, and Ethnic music. The band uses thirteen instruments and five vocalists to create the best musical combination for each song. Saxophones, trumpets, clarinet, guitar, and accordion are added to the keyboards, bass, and drums for the different musical flavors. Three guys & two gals present ever-changing vocal leads & backups. Whether your gathering is a wedding, Christmas party, ballroom dance, club event, whatever, THE DOWNTOWNERS is musical entertainment at its best.